Almost everyone goes through the same phases: you read manga for free online or watch a lot of free anime, you develop a number of favorites, and eventually you dream of drawing your own awesome series. Then again, it doesn’t even have to go that way. Maybe you just want to learn how to draw your favorite characters, or learn enough to doodle in your spare time. Drawing is a wonderful creative hobby, and if you get good at it, who knows how far you could take it? So whether you want to make money drawing manga How Do Webcomics Make Money? 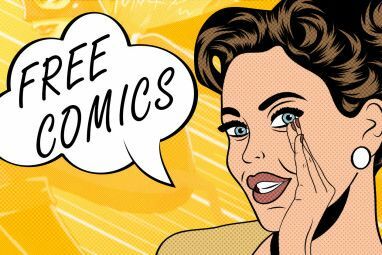 How Do Webcomics Make Money? The web is full of content ranging from general humor webcomics to webcomics for geeks. Whatever your genre, whatever your niche, you will be able to find an audience as long as you write well... Read More or just dabble in it for fun, here are several tutorials and resources to get you started. They’re divided into written resources and video tutorials. Outside of books, high-quality written manga tutorials are few and far between. Here are the useful ones I’ve found. If you aren’t impressed by them, or if you don’t find them helpful, feel free to jump down to the video tutorials instead. They’re much better. If you’ve never visited 4chan, that’s probably for the best — but the site has several sub-communities that are actually quite helpful and productive. One of those sub-communities is /ic/ for artwork and critique. The /ic/ community has an excellent 56-page guide for newbies and first-timers. It covers all kinds of fundamentals and walks you through common beginner topics: mindset, techniques, tools, software, etc. It isn’t manga-specific, but it’s all applicable to manga art. Don’t want to visit 4chan? That’s fine. The guide is publicly accessible on Google Docs Visit 4chan at your own risk! The folks behind Corel Painter, a piece of drawing software used by many artists, have produced a collection of art tutorials meant to get you started from base zero. The tutorials cover traditional art, photo art, and illustrations. One of those tutorials is an overview on drawing manga, which covers eyes, hair, expressions, and other miscellaneous tips. It’s a good introduction if you have no background experience in artistry, and I recommend checking out all of the tutorials. While these were written for Painter, they’re still useful if you use other software. How to Draw Mangas is a free site with a handful of beginner tutorials that newbies will find useful. These aren’t comprehensive tutorials, so don’t expect too much. But they do contain a lot of good tips and concepts that you can use as starting points. Note that the site sells a resource called How to Practice Manga for Beginners for $7, but I haven’t purchased it or looked at it, so I can’t speak to the quality of that guide. Once you’re comfortable drawing manga figures, you can move onto coloring. This coloring tutorial by mk-junior on DeviantArt is a great fundamental resource: it has step-by-step instructions written in text and illustrated in screenshots. There are many ways to color manga, so don’t take this as the one true technique! For example, check out this manga painting tutorial by Celsa on DeviantArt, which also offers step-by-step snapshots supplemented with textual commentary. These days, you can find how-to videos all over the place. I’ve done my best to find the best of the best, and to cover as wide a range of topics as necessary to become a skilled manga artist. Not all of these are manga-specific, but they’re all important. Proko isn’t specific to manga, but it is a must-watch YouTube channel for any aspiring artist. If you get through all of his videos from start to finish, your drawing skills will improve ten-fold. I’m not kidding. He covers two extremely important topics that are rarely taught in detail in YouTube videos: gesture and anatomy. Start with the Figure Drawing playlist (to give your drawings life and motion), then study the Anatomy of the Human Body playlist (to give your drawings proper scale and details). Once you know these fundamentals, manga drawing gets much easier. There are no shortcuts when learning how to draw, but if there were, Proko would be one of them. Do not skip this channel. The Art of Wei channel is a good first stop for newbies. While he does have several videos dedicated to manga art, you’ll actually learn more from his series on drawing fundamentals. Start with the Basic Tools for Drawing and Basic Ways to Pencil Shade playlists. Then make your way through the Drawing Lessons for Beginners playlist. Lastly, check out the How to Draw Manga and How to Draw Hair playlists. Once you grasp these techniques, using them to draw manga will be a cinch. Whyt Manga is the best channel for manga-specific tutorials. Not only are his videos on point, touching on all kinds of topics often overlooked, but he has so many of them that you’ll be learning for a good long time. And we aren’t talking five-minute clips. His videos are always at least 10 minutes long, and sometimes as long as one hour. Start with the Manga Tools, Manga Anatomy, and Manga Tutorials playlists. After that, you’ll learn plenty from the How to Make a Shonen Manga playlist (fight scenes, storyboards, character design, etc.) and the Manga Camera Angle playlist (paneling and other tips for visual storytelling). Mark Crilley is often recommended to manga newbies, and for good reason: he has a lot of content that’ll keep you busy. The artwork in his earlier videos aren’t as good, but the techniques are sound so just keep that in mind and don’t let it turn you off. The How to Draw and How to Make Manga playlists are good starting points. Also, check out his How to Draw Hair and How to Draw Eyes playlists. And don’t forget the Speed Drawings playlist — these can teach you a lot about practical application of drawing theory! Koizu is a YouTube channel dedicated to manga art. You’ll learn genre-specific tips and tricks, like How to Draw Manga Body Proportions, Shading Techniques, and Drawing Poses. The only downside is that the channel has been inactive for two years as of this writing, so don’t expect any new content. Fortunately, there’s enough here to at least get you started. Alphonso Dunn’s channel doesn’t touch on manga at all, but here’s why I’m recommending it: all of his artwork is done with ink. If you’re going to draw manga, inking will be one of the most valuable skills you’ll learn. You should go through all of his videos so you can pick up as many techniques and tricks as you can. But if you’re in a crunch for time, the most important videos are in the Shading playlist. Ignore the gaming half of the mikeymegamega YouTube channel and focus on the drawing half. The Draw, Simple, Easy playlist contains medium-length videos that show you how to draw certain characters from manga and comic books. The Draw With Mikey playlist contains longer videos of him free drawing and chatting with his viewers. While this channel doesn’t offer much in the way of instruction, it’s a great way to learn by watching. You’ll pick up various tips and tricks along the way, and maybe even evolve your own personal style. 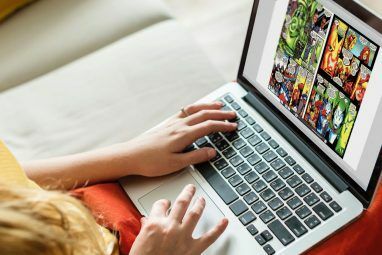 If you’re thinking of creating and publishing a web manga, check out our guide to starting a webcomic for free. 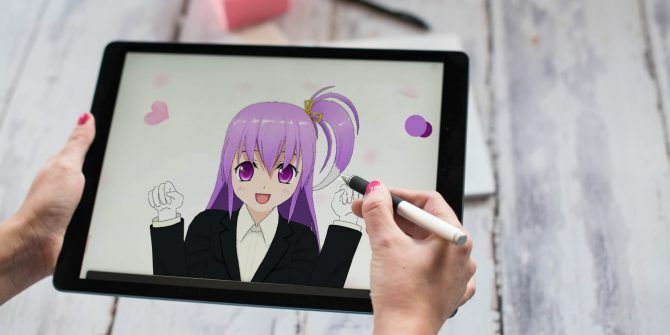 Note that digital manga art can be easier with a graphics tablet The Best Graphic Tablets and Graphics Programs for Digital Design The Best Graphic Tablets and Graphics Programs for Digital Design We've rounded up the best graphic design tablets and software to use if you want to break into cartoons and other forms of digital art. Read More . Lastly, if you’re willing to pay $20 per month for a Lynda.com subscription, we recommend these excellent digital art online courses Learn Digital Art from Scratch With These 22 Lynda Courses Learn Digital Art from Scratch With These 22 Lynda Courses With hundreds of online courses to choose from, Lynda.com is the fastest way to mastery of digital art. Here are a few courses to get you started. Read More . 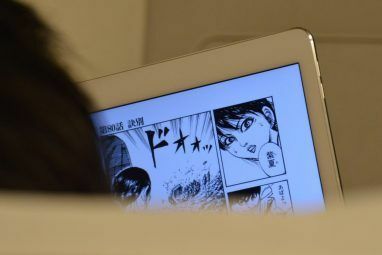 Lynda doesn’t have any manga-specific courses, but the digital comic drawing courses may prove helpful. What’s your favorite anime and/or manga? Are there any other useful learning resources that we missed? Share with us in the comments below! Featured image credit: Bartosz Budrewicz via Shutterstock. Microsoft Paint Remains Part of Windows 10Adobe Photoshop vs. Microsoft Paint: What Do You Really Need? I agree with the comments below. This article deserves more hype because it's actually useful. Thanks for pulling this info together! Agree with all the other comments. This article deserves more hype because it's actually useful. Thanks for laying out this info! i wish i had this before it would've helped me so much but at least i found it now!